Wasn't polenta one of those trendy 90's foods like pasta and Chilean sea bass? It was the decade of carbohydrates (carbs were good, fat was bad, and yet we all got fat). Then Dr. Atkins came along and pasta, bagels and potatoes were tossed over like a chatty Pollyanna on a lifeboat. I think we're more balanced now, some carbs, some protein (and increasingly from vegetable sources) and not worrying about it too much. Sensible. 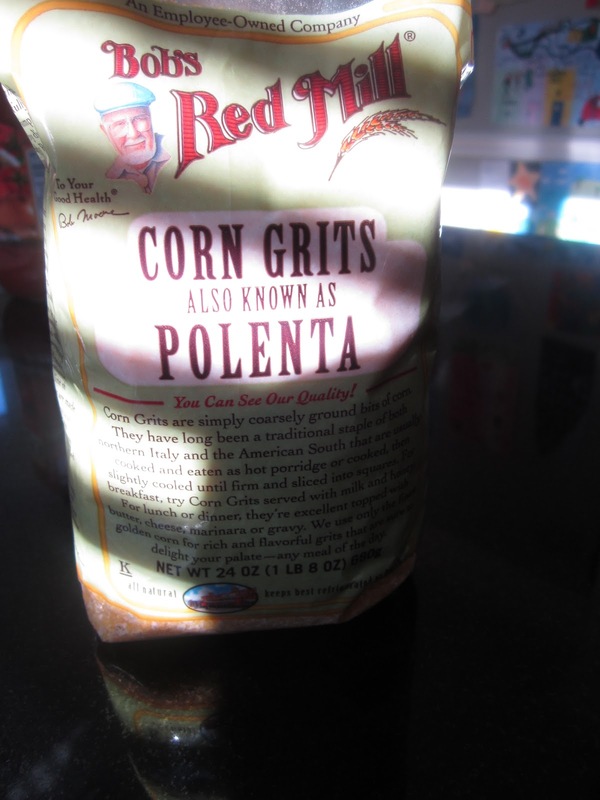 Today I thought I'd revisit polenta and make it from scratch. If I had known it was this easy, I never would've bought those pre-made rolls in the grocery store. You can top it with just about anything, a fried egg like my daughter, an arugula salad like my other daughter or like me with a quick puttanesca sauce. 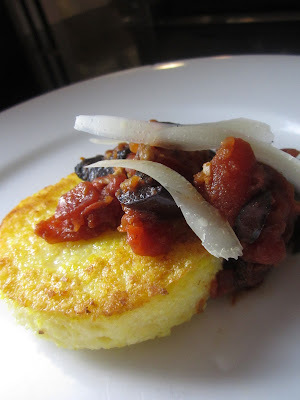 I like how the bold, acidic flavors of puttanesca are offset by the creamy polenta. Bring water and chicken broth to a boil in a large saucepan. 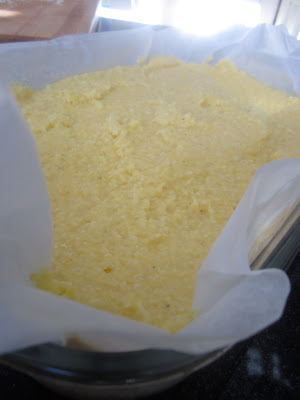 Slowly add polenta, whisking constantly. 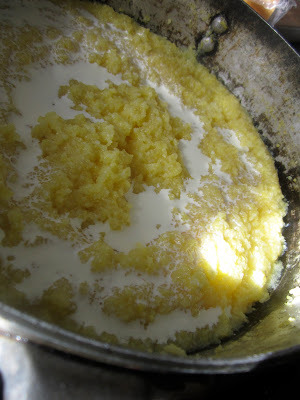 Continue to whisk until polenta thickens, then turn the heat down to simmer and cover. Cook for 20 minutes, stirring frequently until polenta is soft. Add cream, salt and parmesan cheese and stir vigorously. At this point you can serve the polenta soft or spread it in a pan lined with parchment or wax paper and refrigerate for about 3 hours until it hardens and can be cut and fried. warm and semi-smooth like a rustic, corny mashed potato. In the pan and ready for a few hours in the fridge to set-up. Is it just me, or does this sort of look like the state of Minnesota? 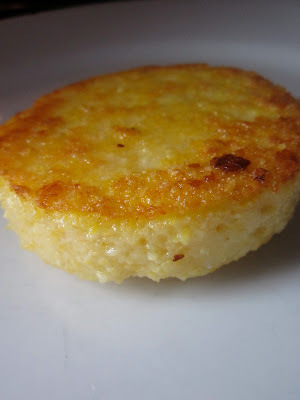 When it's set, remove the polenta from the pan and cut into whatever shape and size you like (I used a 3 inch ring). The polenta will be sculptable so go ahead and let your inner Michelangelo come out to play. Just make sure the top and bottom are nice and flat for even browning. Heat a tablespoon of olive oil in a skillet over medium-high heat and cook for 3 minutes per side until golden. Blot gently with a paper towel and serve. topping you like (or no topping at all). * I have found that olives are so much fresher and tastier when they have their pits. Since this dish is all about the olives, I recommend you take the extra time and pit them yourself. Just gently flatten with a heavy knife and split down the middle. The pit will come out easily. Heat olive oil in a deep saucepan over medium heat. Add anchovies and garlic and cook for a few minutes. Add tomatoes, chopped olives, capers and red pepper flakes. Simmer for 20 minutes and up to a few hours. Serve over polenta (creamy or cakes) with a few shavings of parmesan.